Ceiling fans are a great addition to any room. A slow fan speed in the winter will help move the warm air at the ceiling down into the living area. A more brisk speed in the summer helps your air conditioner seem more effective. Ceiling fans are fairly easy and safe to install. All you need is a basic knowledge of electricity and some basic tools. If you do not have your fan yet, Click here to buy it online! Ceiling fans are available in two general configurations. The first is a fan-only configuration. This configuration is generally the most inexpensive and provides the advantages mentioned above. The second configuration includes a light fixture that hangs below the fan. 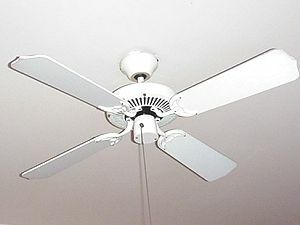 Both configurations generally include a multi-speed fan with a pull chain. If you buy a single speed fan, special power switches are available to allow different fan speeds. One word of advice: it doesn't pay to buy the cheapest ceiling fan available. The cheapest fans are sometimes unbalanced and tend to swing around. This makes your otherwise elegant addition look somewhat ridiculous and detracts from the overall appearance of the room. Spend the extra couple of bucks if you can afford to. Turn off electrical power first.